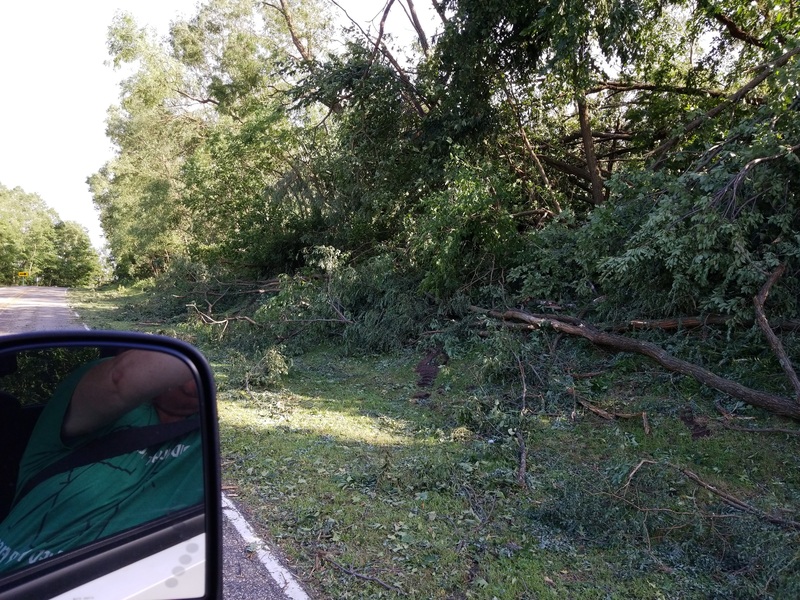 On Aug. 27, 2018, we had a tornado touch down about 3 miles north of us, Wreaking havoc with the trees in the area. 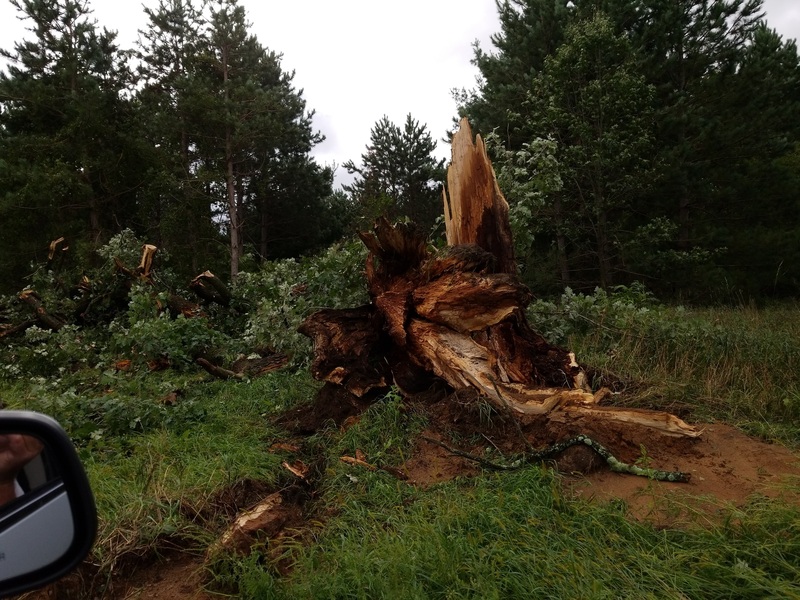 Whole stands of 100' lodgepole pines that are now 30', barns flattened, silos damaged, and lots of flooding. We got 14" of rain in 2 days, with 12" falling on that day in 3 hours! Yes, 3 hours! 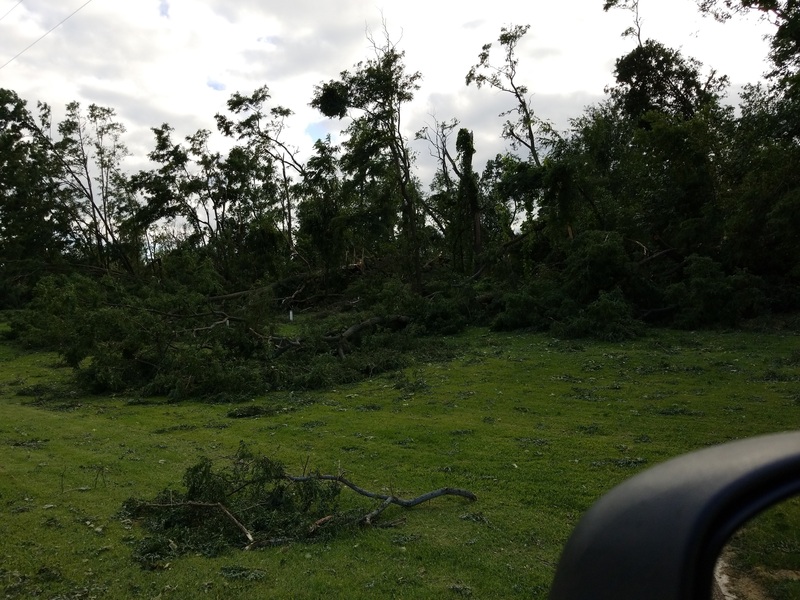 We had no idea this was going to happen, and 45 minutes before the storm, which spawned 19 tornadoes across mid central Wisconsin, we left for Madison for a meeting we had scheduled. As I don't like listening to a radio when I drive, we found out about the storm as we came home around 6:30 pm. There were trees down, power lines down, and, stretches of power lines that were taut because they were holding up entire rows of trees! We were without power for 2 1/2 days. On my little slice of heaven, 10 acres, we lost many, many trees. Surprisingly enough, the house was UNDAMAGED! Here are few pictures of the yard and the area. 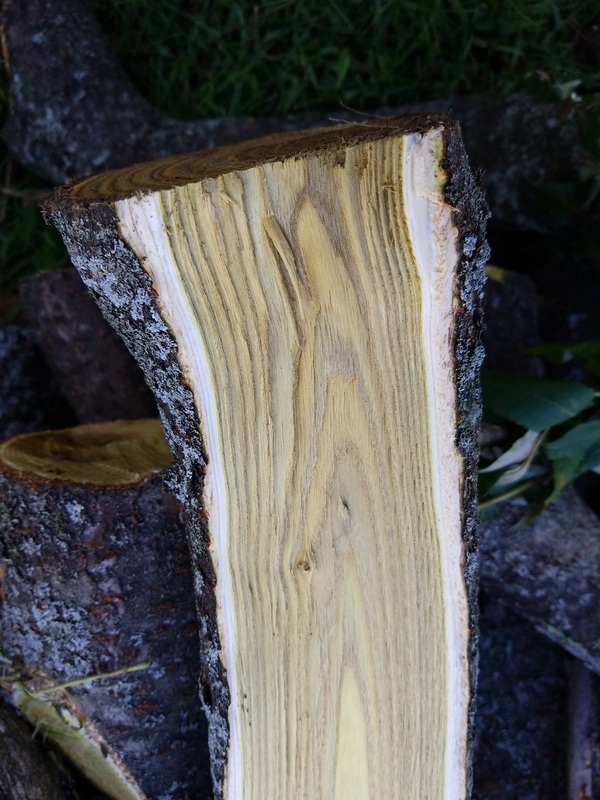 While cutting downed trees into logs, I found this interesting wood. I do know what it is, but how many of you can identify it. Looking at the wood and not leaves/bark... Sumac? Your pickies have many varieties of trees down so I'm just guessing by the wood. Last edited by mark james; 09-08-2018 at 08:02 PM. I agree with Mark. It really looks like Sumac . 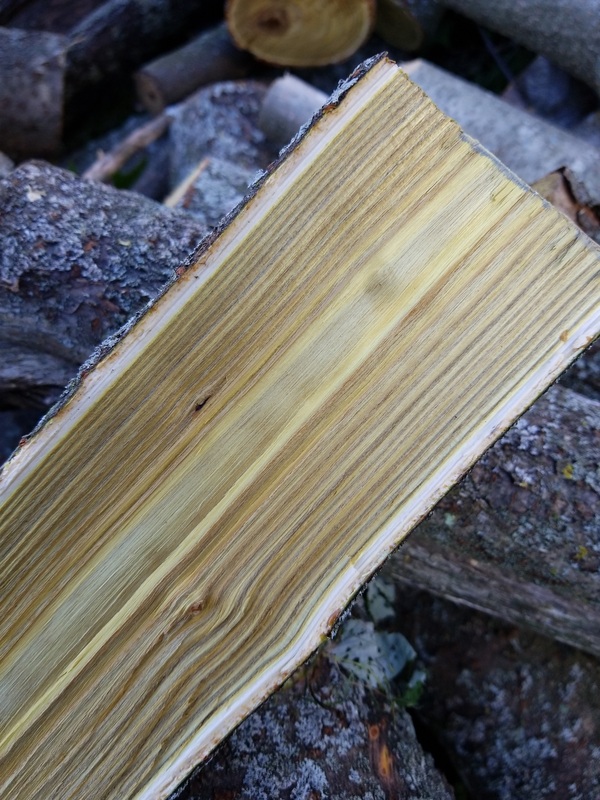 That’s a hard one because just looking at the wood color and grain, it resembles mulberry or a species of locust to me. Good luck! 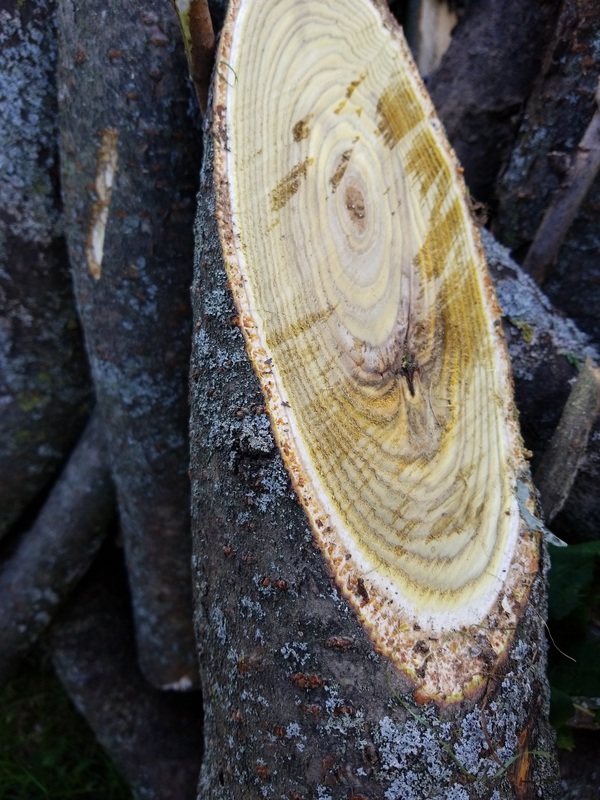 I would take a piece to a local tree service and they would know what trees you have in the area and what it is. Mark and Wood128 are both correct. It is Staghorn Sumac, of which I had 8 and now only have 2... and I will probably lose 1 of those. I'll probably be cutting wood for the next year, tho, I do have a pro coming in to take down all the Widow-makers that are hanging around. Does the grain remain after it is turned, does anyone know? I have a couple of crotch pieces my wife thinks might make nice bowls or vases. I have tons of pieces to convert to pen blanks, if I can retain the look of the grain. Last edited by WIDirt; 09-08-2018 at 09:22 PM. Should retain most if not all of the colour variation as it dries . Best way to get the benefit of the beauty is angle or cross cut . Can`t tell diameter from your photo , but if 4 inches or over , could make cross cut S&P shakers for your wife (the straight grain ones I`ve made also look nice) . Bowls , vases pepper mills , oil lamps , candle holders , potpourri dish , boxes (turned or flat) - looks like you have enough to do it all , unfortunately .